This has been looked at a few times over the years but this may be a bit different. My wifes Cougar has a surge, what appears to happen is when under extreme load (goining hard uphill) it changes up and down radically and really hammers when it changes back (obviously an auto). Sometimes when driving steady uphill it it will change up and down, however, much more than normal there is also some involuntary changes to engine revs. I can drive it around gently with no issues at all. If I was to guess I would think a computer control for the auto, but unsure how they work. What I am hoping for is all you Cougar owners with some spare time might like to give it some thought. It could be a problem with the transmission. I had a problem a little while back where it was randomly changing gears for no apparent reason. Turned out that what happens is the switches on the top of the gearbox can get mud/dust/water on them over the years and eventually fail. Take it to a transmission specialist and get him to check it for you. Good to own but "High Maintenance"
Thanks Arrow, would this fault show up if I check the codes??? I booked it in tomorrow to see what shows up. I felt it was a transmission fault but I like to know what the problem is before I let the mechanics loose on it. It will show up with the codes. Most of the times this behaviour is caused by inhibitor switch on the auto or could be a faulty TPS (throttle position sensor) sensor. Let me know if you need reference for a particular code. Cheers. 00' MTX 2.5L (Limited edition Eibach Cougar); Dark Green Tourmaline; Lowered with Eibach tuned suspension from factory; SVT UIM, LIM & Throttle body; Supercat 2.5" dual exhaust with twin pipe quad outlets; Custom headers; Custom coloured instrument cluster; K&N Apollo CAI kit; Calibre oil catch can. Checked the codes today and the scan tool advised the EGR valve was faulty, does this valve have another name? Where would I find this under the bonnet and can it be cleaned to get it working again and most importantly does this sound like it could be the cause of the problem???? I dont know what model is yours, some have diaphragm regulators (No.2 in second image). You should find the control asy which is in image 1. It is not serviceable. Before replacing that I would suggest to go over all vacuum hoses around the regulator. If they are loose or broken or off then that could be the culprit. Lot of surging problems are caused by vacuum hoses. Go to a professional to replace the valve or hoses. Hoses are plastic and could be brittle. If you break one of them, its hard to find replacement ones. Let me know if you need more info or more pics. Is this problem only with the autos? My manual occasionally surges too, revs go real high when changing gears. Haven't taken it to anyone yet. Thanks Yogi mine is a 2000 and the bottom shot looks like mine, had a look at removing item 2, there is an exhaust pipe attached to the base so it looks like it may have to be disconected from the exhaust manifold. Are items 2 & 3 able to be removed and cleaned. I will go over all vacuum hoses and check for leaks as advised. Sorry Cougar Girl not able to answer your question. Unfortunately, none of them are serviceable. Be careful when working with those hoses. Best option would be to find a second hand one if new one is expensive. Call 0297251188 and ask for Carmen. This guy is wrecking a Cougar (Auto) and is in NSW. Yes this is only with Autos. 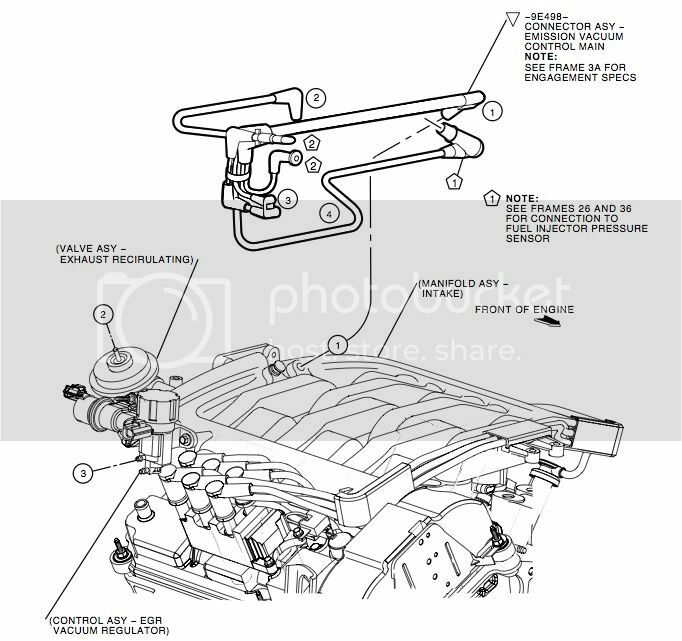 On manuals you dont find any of these, the problem could be with Throttle Position Sensor (TPS) or one of the vacuum hoses. I remember someone had this problem before and was fixed by the vacuum hose. Get it scanned for trouble codes and that will pin point the exact problem. 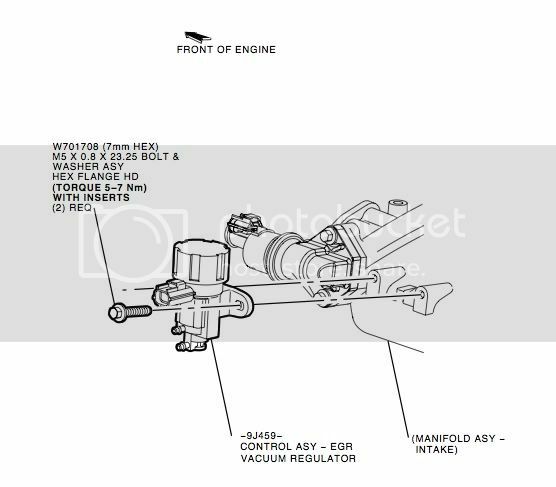 Based on my model being the 2000 and that being the bottom diagram which valve would think is the one refered to by the Scan Tool as the "EGR Valve", I would prefer to replace just the faulty item. I will contact Carmen and see what they have but past experience with them, they seem to throw all items they are unsure about. Still trying to sort this problem, checked the EGR valve via a method described in a pommy forum. It simply advises to diconect and block off hose to EGR if problem is no longer there it may be the EGR or more likely the DPFE Sensor. Mine tested ok. Took it for a longer run today (work 5 k from home) and it started to shift eraticly so I turned off the OD and it got worse, turned OD back on it got better. I then turned the OD off again and the OD light flashed as did the Transmission Warning Light. Drove it for another 1/2k and it settled and ran really well for the next 15k. Stopped resarted after 10 min and it again changed up and down then after 1/2k settled and ran fine for the next 15k. I am still thinking transmission problem but am not up with the electronic controlled units. I intend to try another Scan tool tomorrow to see what that comes up with. Thanks in advance. Ran the scan tool on the Cougar today and picked up a code from my it was memory "0708" which is a faulty "Inhibitor Swith" also known as the Gear Position Switch or even a Manual Lever Position Swith, sounds a lot like what was suggested by Arrow earlier. I am now trying to source a new item, if anyone has an ide where I could get please advise. If any one has replaced one of these how is the best way to access it. You can see it on top of the tranmission below the battery tray. I get all my parts from here, just checked for you $25.99 plus shipping and you will get a brand new one. Look under transmission and you will see Gear Position Sensor. Thanks Arrow, just ordered the part about $56 all up. When you say to look under the transmission do you mean under the battery tray or under the vehicle??? No I meant "transmission" on the rockauto website. Thanks I'm with you now. Thanks for your help I will let you know how it all goes after all is fixed. Hi all, the new Gear Position Sensor arrived in under 2 weeks from the original inquiry. Fitted it up on the weekend and problem solved. The Cougar is running better than ever with the new sensor and the Cold Air Intake. I didn't price a sensor from Ford it may be interesting to check their price. Thanks all for the help. Would you mind telling part number for the Gear Position Sensor? I've checked at Rockauto under Transmission and there's no such thing, only cluch parts. I think it may be a case with my Cougar too, revs jump up after putting in neutral, realy annoying. Just did a quick check and the part has changed I bought a Gear Position Sensor Part # WEL F483 by AIRTEX/WELLS at $25.99au plus freight, however, that part is no longer listed. Look under Auto Transmission - Shift Lever - Part # SW6274 by MOTORCRAFT AT $41.79us See if the part pictured is the same as yours. Parts do seem to change with Rockauto depending were they source them from. Before ordering a part get a good mechanic with a reader to check the system to ensure it is the Gear Position Sensor, this part has several names. Look under Mercury Cougar not Ford!!! If you do as Yogi has suggested and look at "Switch and Relay" then "Neutral Safety Switch/Sensor" you will find about 4 others to look at. Here are a couple more names for this item.